While relatively small quantities of water appear to be colorless, water's tint becomes a deeper blue as the thickness of the observed sample increases. 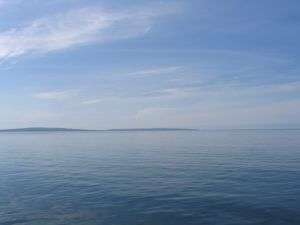 The blue hue of water is an intrinsic property and is caused by the selective absorption and scattering of white light. 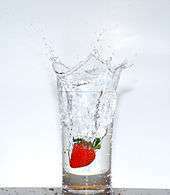 Impurities dissolved or suspended in water may give water different colored appearances. For more details on this topic, see Electromagnetic absorption by water. 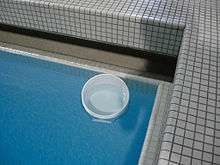 An indoor swimming pool appears blue from above, as light reflecting from the bottom of the pool travels through enough water that its red component is absorbed. The same water in a smaller bucket looks only slightly blue, and observing the water at close range will make it appear colorless to the human eye. The intrinsic color of liquid water may be demonstrated by looking at a white light source through a long pipe that is filled with purified water and closed at both ends with a transparent window. The light turquoise blue color is caused by weak absorption in the red part of the visible spectrum. For most substances, absorptions in the visible spectrum are usually attributed to excitations of electronic energy states. 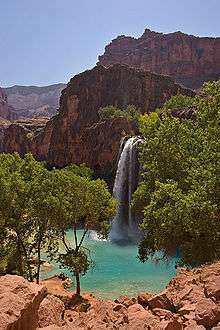 However, water is a simple 3-atom molecule, H2O, and all its electronic absorptions occur in the ultraviolet region of the electromagnetic spectrum and are therefore not responsible for the color of water in the visible region of the spectrum. Nevertheless, the water molecule has three fundamental modes of vibration, including two stretching vibrations of the O-H bonds which occur at v1 = 3650 cm−1 and v3 = 3755 cm−1. Absorption due to these vibrations occurs in the infrared region of the spectrum. The absorption in the visible spectrum is due mainly to the harmonic v1 + 3v3 = 14,318 cm−1, which is equivalent to a wavelength of 698 nm. 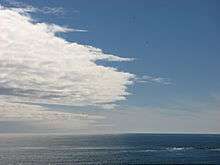 Some of the light, hitting the surface of ocean, is reflected back directly but most of it penetrates the water surface interacting with its molecules. The water molecule can vibrate in three different modes when light hits it. The red, orange, yellow, and green wavelengths of light are absorbed so that the remaining light we see is composed of the shorter wavelength blues and violets. This is the main reason why ocean color is blue. 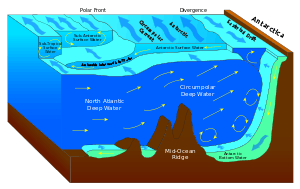 Glaciers are large bodies of ice and snow formed during very cold climates by processes involving the compaction of fallen snow. While snowy glaciers appear white from a distance, up close and when shielded from direct ambient light, glaciers usually appear a deep blue due to the long path lengths of the internal reflected light. Relatively small amounts of regular ice appear white, because plenty of air bubbles are present, and also because small quantities of water appear to be colorless. In glaciers, on the other hand, the pressure causes the air bubbles, trapped in the accumulated snow, to be squeezed out increasing the density of the created ice. As large quantities of water appear to be blue therefore a large piece of compressed ice, or a glacier, would appear blue. Water color can reveal physical, chemical and bacteriological conditions. In drinking water, green can indicate copper leaching from copper plumbing and can also represent algae growth. Blue can also indicate copper, or might be caused by syphoning of industrial cleaners in the tank of commodes, commonly known as backflowing. Reds can be signs of rust from iron pipes or airborne bacteria from lakes, etc. Black water can indicate growth of sulfur-reducing bacteria inside a hot water tank set to too low a temperature. This usually has a strong sulfur or rotten egg (H2S) odor and is easily corrected by draining the water heater and increasing the temperature to 120 °F (49 °C) or higher. The odor will always be in the hot water pipes if sulfate reducing bacteria are the cause and never in the cold water plumbing. The color spectrum with water indicators is wide and, if learned, can make solving cosmetic, bacteriological and chemical problems easier to identify. 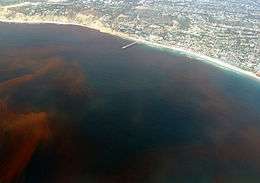 Red tide off the California coast. The Ancient Greek poet Homer uses the epithet "wine-dark sea"; in addition, he also describes the sea as "grey". Some have suggested that this is due to the Ancient Greeks classifying colors primarily by luminosity rather than hue, while others believe Homer was color-blind. 1 2 Braun & Smirnov 1993, p. 612. ↑ Pope; Fry (1996). "Absorption spectrum (380-700nm) of pure water. II. Integrating cavity measurements". Applied Optics. Bibcode:1997ApOpt..36.8710P. doi:10.1364/ao.36.008710. ↑ ":"...any simple answer is bound to mislead. It turns out that contributions to the observed color are made both by reflected skylight and by the intrinsic absorption..."" Braun CL, Smirnov SN (1993). "Why is Water Blue?" (PDF). J. Chem. Edu. 70 (8): 612. Bibcode:1993JChEd..70..612B. doi:10.1021/ed070p612.